There is something almost alchemical in the way that an almost tasteless tomato becomes rich with flavour when slow cooked in an oven. This has become one of my go to dishes when the heady flavour of summer tomatoes starts to give way to the more bland and often pappy texture of imported fruit. In this recipe I love the contrast of the concentrated tomatoes against the salty cheese and zing of the thyme. It’s also a great multi-tasker of a recipe: it stands alone proudly as a main course, (I’d serve it with a simple peppery rocket salad), but is equally good when paired with grilled meat. It can be served hot or cold, and is particularly good as a salad to make in advance – maybe for a buffet, or for a picnic, as the barley keeps its integrity and doesn’t go soggy. Cook’s Note: It’s important to roast the tomatoes slowly on a lower heat than normal, as this stops all the juices leaching out and evaporating, keeping the tomatoes plump and glossy, concentrating their flavour, and stopping the edges blackening in the heat. Heat the oven to 150C. Halve all the tomatoes, and arrange cut side up in a shallow metal roasting pan. Spoon over all the olive oil, making sure that the tomatoes are all shiny with oil, top and bottom. Do not add salt as this causes the tomatoes to dry out whilst cooking. If serving as a cold dish, at the same time that the tomatoes go in the oven, cook the barley by simply adding it to a large pan of simmering water with a pinch of salt. Cook until soft – about twenty minutes. Tip into a colander over the sink to drain. I like to pour over a kettle of boiling water to remove as much as starch as possible at this point, as otherwise the barley can become sticky. Leave the barley in the colander to cool, forking through as it cools to make sure it doesn’t stick together. When it’s cold, tip the barley onto a platter. 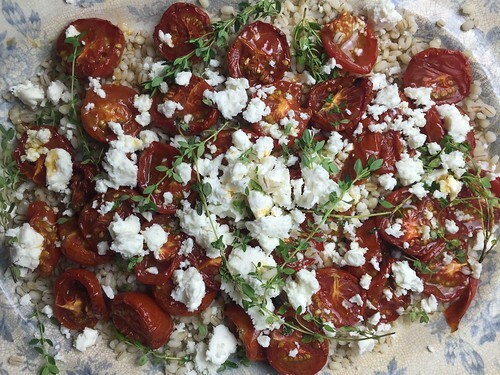 If serving hot, start cooking the barley about half an hour before the tomatoes are ready, drain as above, leave for five minutes to steam dry, and then tip onto the serving platter. When the tomatoes are cooked, carefully lift them using a fish slice or flat spatula and arrange on top of the barley, cut side up. 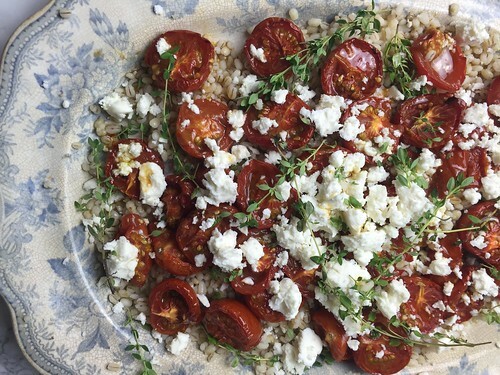 Crumble over the feta and then spoon over all the lovely rich tomato-y cooking juices from the roasting pan. Pull the leaves off several sprigs of thyme and scatter over the dish, then sprinkle over the sea salt and generously grind some black pepper over all. Decorate with more sprigs of thyme if so moved. EVENTS. Vita all’Interno: The House of Peroni London 2015. Dishy. I do like a roast tomato, and this looks like a lovely early Autumn supper. I’ve found someone who ensures I’ll eat! So busy at work each day added to the fact that I can’t cook and a single moment in the kitchen is somewhere I’d rather not be…. now I can actually relate to a cook – who speaks in a language I recognize like popping the work ‘simply’ in here and there and making a tasty dish from very few products! Tasteless tomato ?! What kind of tomato do you eat ?! 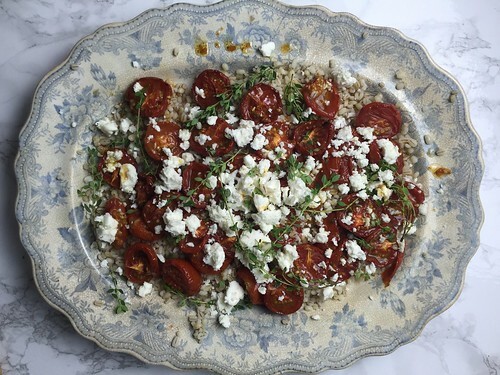 You had me at slow roasted tomatoes – such a favourite in this household! Lovely, this looks so delicious. I would love to eat it right now.